and create an atmosphere of learning as students share their experiences with other students in their fields of study. Experiential Learning@MGA is the name of Middle Georgia State University's Quality Enhancement Plan (QEP). Experiential Learning@MGA is focused on enhancing and supporting experiential learning opportunities, by promoting exploration and application beyond the classroom. A QEP is part of a college or university's reaffirmation process, the process by which the university's accreditation is reviewed and approved on a regular basis. The QEP is a carefully-formulated plan of action created to address a well-defined topic or issue(s) related to enhancing student learning. Middle Georgia State's plan, developed by the University's faculty, staff, students, and community partners, complements the institution's ongoing strategic planning, academic planning, and evaluation process. What are the QEP's student learning outcomes? Students will explain the values and behaviors of professionalism. Students will explain the values and behaviors of social awareness. Students will explain the values and behaviors of civic responsibility. Students will utilize classroom knowledge and professional experiences together to prepare them for their chosen career. Students will analyze the relationship between academic knowledge and professional application in their chosen field. Students will test academic and professional knowledge and skills in a professional setting. What is Experiential Learning (EL)? And how does it benefit me? Through Experiential Learning – learning through direct experiences and reflection on those experiences – students are given an opportunity to deepen their knowledge and develop skills in authentic, real-world situations both on and off campus. Through internships, service learning, undergraduate research, and other EL opportunities, students' learning in the classroom becomes more powerful, facilitates career exploration, and provides a competitive advantage as students enter the workforce. What experiences count as official ‘Experiential Learning' experiences? Many classes at MGA already have significant experiential components. There will be a variety of EL courses offered across the departments and colleges within the University, and department based faculty, functioning as Experiential Learning Liaisons, will aid in sharing relevant information and pathways with their students. Throughout the implementation process, courses will be formalized and designated for easy identification. When will Experiential Learning@MGA be available at Middle Georgia State? Pilot programs are beginning in Fall Semester 2015; full implementation will take 3-5 years. More EL activities will be available as the program continues; faculty members functioning as Experiential Learning Liaisons will aid in sharing opportunities with their students. How will my participation in Experiential Learning@MGA activities be recognized? You will have an opportunity to take part in an annual Undergraduate Showcase, where Middle Georgia State students will present research, share experiences, and challenge their peers to consider new points of view and new ways of thinking. An electronic Experiential Learning transcript will archive the individual courses, activities, and projects you participate in and be available for several years after your graduation to highlight your accomplishments. If I change my major, do my achievement levels reset? No. All of your EL experiences will count towards your Bronze, Silver,Gold, and Platinum award, even if you change majors. Will this affect my overall cost of my MGA education? Not usually. Students will have the opportunity to participate in many different EL opportunities, most of which will incur no additional cost. Will this affect my time to graduation? No. The opportunity to participate in experiential learning opportunities will not add credit hours to your degree requirements. Additionally, there should be no effect on your time to graduate, depending on class availability and pathways chosen. Experiential Learning@MGA is a quality enhancement initiative for Middle Georgia State University that will begin implementation Fall semester 2015. As designed and publicly affirmed by the SACSCOC Re-Affirmation Visiting Team, this initiative has the power to transform the educational experience for our students in a positive and substantive way. It can also serve as a catalyst to make us a destination institution. In advance of the work before us, we want to personally thank all members of our MGA community for support of this initiative. 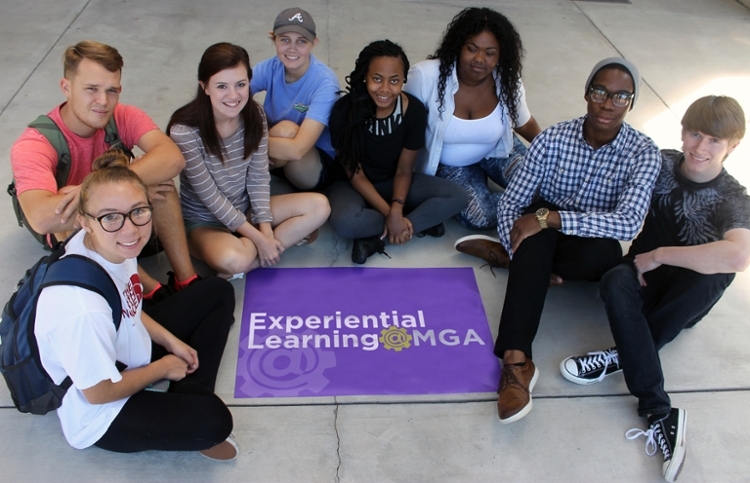 Experiential Learning@MGA is focused on enhancing and supporting experiential learning (EL) opportunities, by promoting exploration and application beyond the classroom. Through internships, service learning, undergraduate research, and other EL opportunities, students' learning in the classroom becomes more powerful, facilitates career exploration, and provides a competitive advantage as students enter the workforce. Since Fall of 2015, many incoming MGA students have satisfied the first requirement (i.e. The Bronze Level) of Experiential Learning@MGA s and earned the bronze designation thru dedicated assignments in their FYES course (when offered). Others who have not completed it thru FYES may do so, through the following avenues - (1) Various Student Affairs events and activities (2) Student Orientation (3) RSO participation (4) through the Office of Experiential Learning or (5) concurrent to your participation in your first Experiential Learning course ( See @ symbol on course schedule) Instructions for self-registering for the course can be found here ( insert hyperlink and trifold color pdf file attached) The module introduces students to the concept of experiential learning, professionalism, civic responsibility, and social awareness and contains a short assignment to assess understanding of the concepts presented. Successful completion qualifies a student to participate in concurrent or later Silver, Gold, or Platinum Level opportunities within their discipline. Beginning in Spring 2017, the following standard applies to the completion of the Bronze Level Module as part of the Experiential Learning@MGA initiative. All students seeking to participate in the experiential learning program (Experiential Learning@MGA) must complete the bronze level module either prior to starting a course/activity qualifying for the Silver Level designation or complete the module concurrently with their attempt at Silver designation. Note: Students that completed a Silver Level project before Spring of 2017 (i.e. concurrent to the piloting of the Bronze Level in FYES) shall be “grandfathered in,” or exempt from the Bronze Level Requirement. The Middle Georgia State University Institute for Applied Aerospace Research (IAAR) focuses on conceptual development, prototyping, manufacturing processes, safety and quality management in the areas of advanced composite materials, aerospace structures and Unmanned Aerial Vehicles. Our principal goals are to create and disseminate knowledge in the application of advanced materials and processes, to enhance the educational process at Middle Georgia State University through faculty development and student interaction with the work of the Institute, and to support aerospace-related economic development in central Georgia. For more details, email Director Rick Krontz at rick.krontz@mga.edu. What is my EL Status? You can download and print out a full record of your experiential or co-curricular transcript by selecting the Student Record tab and Display Experiential Co-curricular Transcript Tab in SWORDS. There you will be able to see your EL status, volunteer hours, leadership positions, internships held, scholarly and creative work, international and domestic study programs, and more. If you have any questions you may email ExperientialLearning@mga.edu.